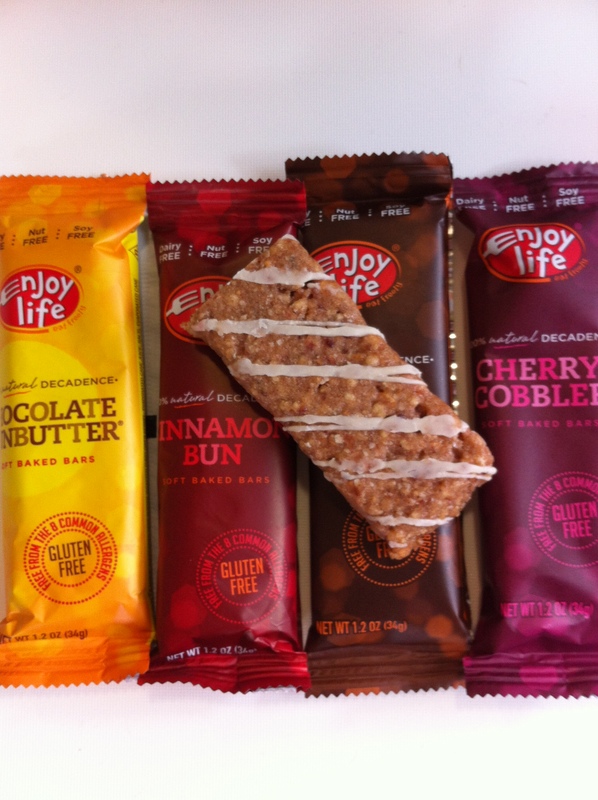 Back in May, Enjoy Life Foods sent me free samples of their Decadent Bars which I loved. I’m a big fan of their products, so when they asked me to review their Chewy Bars I couldn’t say no. There are so many healthy meal replacement/snack bars on the market but for the most part they all taste the same to me. Enjoy Life bars are different. Their bars are dairy, soy and nut free and also gluten free. Usually when you have a product that is gluten and dairy free you sacrifice flavor, but these bars are very yummy and satisfying and soft and chewy. They come in Caramel apple, Cocoa Loco, Sunbutter Crunch, and Mixed Berry My faves are the Mixed Berry and Coco Loco. I take them along on hikes when I need a quick, easy to digest snack and also to work to satisfy that 3PM craving for something sweet. They also sent me a free sample of their Dark Chocolate Morsels for baking. Most of my life I’ve been a milk chocolate lover, but lately my taste buds have preferred dark chocolate. Doesn’t hurt that dark chocolate is healthier than milk chocolate and has anti-oxidants so I don’t feel as guilty about indulging. Before I tried baking with the morsels I sampled a few pieces and was immediately hooked. After I ate half of the bag I forced myself to stop so that I’d have some left over to put into my gluten free chocolate chip cookies. Dark chocolate is usually dry and chalky with a bitter aftertaste. 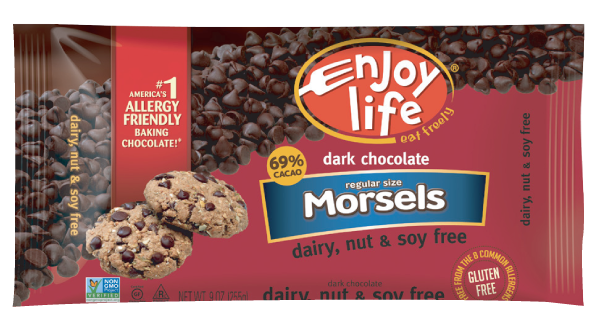 These dark chocolate morsels are so delicious I could eat the whole bag as-is, but they are especially delicious baked into your favorite treat. The more popular baking chips contain milk solids and if you are dairy free these would be a great alternative. They also contain 69% cacao. While both their Chewy Bars and Chocolate Morsels are free of common allergens and are generally healthier than their popular counter-parts, they should still be consumed in moderation and should not replace a healthy balanced meal. For most of the country, June means laying on the beach, playing tennis, long bike rides and firing up the grill. If you live in Seattle it usually means staying home and watching the rain from your window or sitting in a coffee shop with your lap top. Seattleites usually have to wait until after July 4th to experience summer. We have had some warm sunny days where the thermometer actually breaks 70! but for the most part it still feels like autumn. One of my favorite things to do when summer finally arrives is attend outdoor barbeques. However, If you are vegan or vegetarian, when it comes to what to actually throw on the grill, your choices are limited Corn on the cob, maybe some grilled veggies. Nothing wrong with any of that. But maybe you miss having an occasional burger. Well how about a Sunshine Burger ? 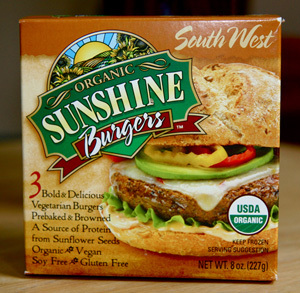 Sunshine Burgers are Non GMAO Project verified, USDA certified organic and gluten free. Most veggie burgers contain wheat as a filler so they are out of the question for someone with celiac, like me. 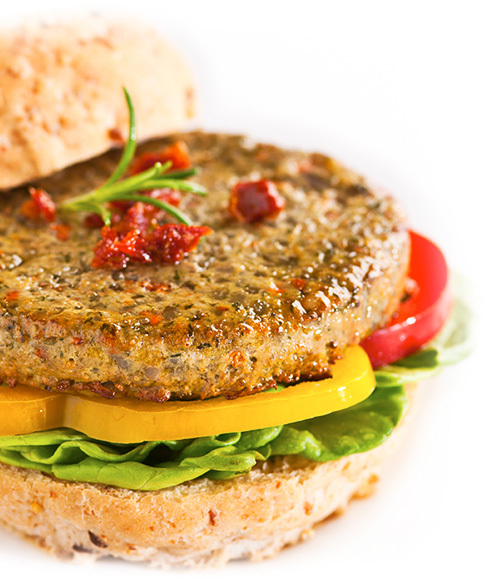 The main ingredients in Sunshine Burgers are brown rice and raw sunflower seeds. Then they add beans, veggies, quinoa, tahini and lots of spices. Sunshine Burger & Specialty Food Co. sent me coupons to try their products for free and write a review. I tried the Garden Herb, Barbecue and Black Bean Southwest flavors. They come 3 patties to a box and average between 200-250 calories per patty and contain between 7-10 grams of protein and are relatively low in sodium. I thought it was a little strange that they come 3 to a box and not 4. I found 2 to be just about right for a meal and that leaves 1 in the box which might prompt you to buy 2 boxes. Price-wise they average about $1 per pattie. Other veggie burgers usually try too hard to mimic the texture of an actual burger and mostly fail or are too grainy and fall apart. Sunshine burgers are kind of in-between. I first tried the Black Bean Southwest flavor. I used a little olive oil in the pan and browned both sides so that it was a little crispy and then put the burger on a gluten free hamburger bun with a little organic mayonnaise, some tomato and some lettuce. I would not compare a Sunshine Burger to a real hamburger, but they are quite delicious in their own right. The Barbeque flavor has a rather strong liquid smoke flavor, which I’m not a big fan of but if you like that flavor in a burger I think you would like this. I cooked it in the oven with a little barbeque sauce on top. It wasn’t bad, just not my favorite. I went to their website and tried their couscous and veggie bake recipe, but since I can’t eat couscous due to celiac, I substituted brown rice. It was delicious! The addition of the garden burger gave it a nice herb flavor (mostly dill as far as I could tell) and made the meal feel a little heartier. Overall I give Sunshine Burgers a very positive review. I will definitely buy them in the future to bring to barbeques and to add to stir frys or just to cook as-is on the stove-top like a burger. Enjoy Life kindly sent me free samples of their new soft baked bars for review. I have reviewed their products before, so I was looking forward to trying them. I’ve mentioned before that I am a grazer. I eat many small meals throughout the day. I usually like to have a piece of fruit or some kind of protein or low carb bar as one of those meals to satisfy my sweet cravings. 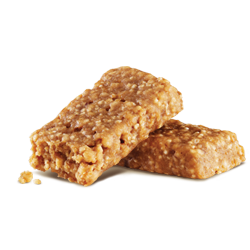 Most of the protein bars on the market do not appeal to me. I don’t like the texture or taste, so I was pleasantly surprised when I took my first bite. It can’t be easy to make a yummy baked product free of the 8 common allergens including dairy, nuts, wheat, egg and soy but Enjoy Life has done it. The bars are really delicious. They are sort of in-between a bar that is all fruit and nuts and one that does contain some wheat. They have a nice chewy texture and are sweet enough to satisfy those sugar cravings. They are sweetened with tapioca syrup and brown pure cane sugar. Other healthy ingredients are quinoa, raisins, amaranth, and infused dried orange peel. I tried their cinnamon bun, smores, chocolate sunbutter and cherry cobbler flavors. If you love sunbutter you will love the sunbutter flavor. It really comes through without overpowering the bar. I love anything with cinnamon in it so the cinnamon bun flavor is my favorite and the cherry cobbler is a close second. The bars average about 130 calories which is just right for a snack. They are not low-carb, so if you are on a low-carb diet, like I am, do not go crazy. Just because a product is gluten or nut-free does not mean it is 100% gluten or nut-free. Enjoy Life is certified by the Gluten Free Certification Organization (GFCO) and their products are made in a dedicated nut-free and certified gluten-free facility so you can feel safe eating their products if you do have allergies or gluten sensitivity. If you have food allergies and are looking for a safe, tasty treat, you won’t be disappointed. I give them 2 thumbs-up!!! If you currently take one of the popular over-the-counter medications for acid reflux or GERD disease you should read this article. It addresses what many of us in the holistic community have known for years. That these drugs may be useful for acute conditions but are very dangerous for chronic long-term use. As with many drugs on the market today, they wind up causing a more extreme version of the disease they were designed to treat. Before you start a regimen of protein pump inhibitor drugs, have your doctor test your enzyme levels to see if you truly are overproducing acid because many times an undeproduction of acid mimics the same symptoms. With the fairly recent popularity of gluten-free products, it seems like a new GF products hits the market every couple of days. As a result, it is hard to keep up. That’s why I was happy to hear about a new company called Savorfull. Savorfull is the brain-child of Nutritionist CEO and Founder Stacy Goldberg, MPH, RN, BSN. The idea behind Savorfull is to introduce you each month to new wheat, dairy and peanut free products. When you join Savorfull you will receive a monthly tasting box with 5 products hand picked by Stacy and her team and a username and password which gives you access to all sorts of information about the products including nutritional information and recipes using the products you receive. Kind of like a healthier version of cookie or cheese of the month club catering to those with food sensitivities. 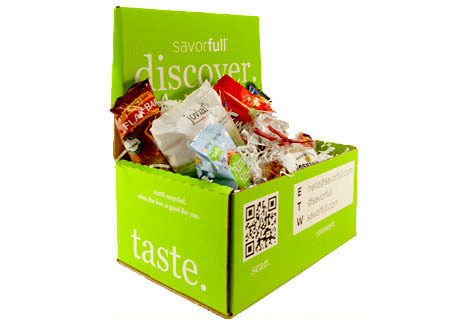 Each Monthly Tasting Box includes small to full size samples of products that the folks at Savorfull think you will love. I received a free sample box recently and it reminded me of when I used to receive gift boxes from my mom full of my favorite foods. Part of the fun is that you have no idea what you will receive. You can choose a 1, 6, 12 month or gift subscription. Jessicas Natural Granola- this was a sample bag and just enough for breakfast or enough to top 2 yogurts. The granola had a nice vanilla/maple flavor and just the right amount of sweetness. Their granola is made with certified gluten free oats. When you join Savorfull and log into your account you will see recipes utilizing the sample products i.e….they have a very yummy sounding gluten free apple crisp that is made with this granola. I can’t wait to try this easy-delicious sounding recipe. Funky Monkey Jivealime- Funky Monkey uses a freeze drying process that somehow turns a piece of fruit into a crunchy snack, almost like a potato chip. The sample included in the box was JacaLime (pineapple with lime). I love pineapple and I love lime and the two together were very tasty, although maybe slightly too sour for me. But I loved the crunchy texture and the fact that there was no added sugar. Each ounce contains 3 servings of fruit, a very easy tasty way to get your servings of fruit in for the day. Jovial Brown Rice Pasta- I have reviewed this product before. A sample bag of this pasta was included. Jovial pasta is made in Italy where they have lots of experience with gluten free pasta. Most gluten free pasta is not very good. Jovial pasta can go up against any wheat pasta on the market. It is fabulous. Live Smart Bar Fit Cookie- My friend tested out this cookie for me and really liked it and said it was very filling. She was tired of the bars on the market and said it was nice to eat a wholesome healthy cookie for a change for breakfast. Home Free cookies- the box included a sample bag of their vanilla cookies. I have not tasted a bad gluten free cookie lately and these are no exception. Small and round and very crunchy they taste almost exactly like a Nilla vanilla wafer but much crunchier. Actually they taste exactly like animal crackers to me. I really liked them and was kind of glad the bag was small because I could have eaten 3 times as many. I really enjoyed my sample box overall and each of the sample foods in it. They are foods I will probably include in my diet from now on. The boxes are just $15 a month and the shipping is free. I think signing up for a monthly Savorfull box is a great way to try out new allergy/wheat free products and at $15 it is priced just right for what you get. You will definitely look forward to receiving your box every month full of tasty goodies. Stacy mentioned to me that next month they will have a strictly gluten free box. If you give the service a try for one month I think you will be hooked! Occasionally when I am at the supermarket I find myself standing behind a mom with her kids. I like to sneak a peek in their shopping cart to see what they are buying. Usually I am appalled and have to hold my tongue. Even worse than their food choices are their drink choices. Their carts are filled with sodas and juices. I think in a lot of cases, some moms think that juice is a better choice than soda for their kids. In some ways they are, as juice does not contain phosphoric acid (in soda) which is said to leach calcium from our bones or caffeine… but some juices contain preservatives and added sugar as well and most contain very little actual juice. And then there is the fact that the juice was probably extracted weeks or months ago and has lost its vital enzymes. That leaves water and fructose , which is another name for sugar. So what should you drink? The best choice would be filtered water or freshly squeezed juice. However, most people do not like the taste of water or have the time or money to spend on a juicer. As far as water goes, there are a ton of choices out there. The waters that contain vitamins are not necessarily a good choice because the vitamins most likely are synthetic. Bottled water tastes like……bottled water. Not too exciting. 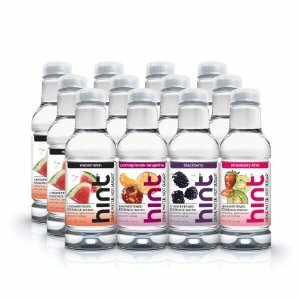 I recently recveived free samples of Hint Premium Essence Water. The concept behind the product is basic: pure water with just a “hint” of natural flvors. They do not contain any added sugar or sweeteners. They come in an interesting plastic bottle with a great label. The bottle has a wide mouth which is nice for a change. And I love their choice of exotic flavors like watermelon, raspeberry-lime and pear. Now this product is called Hint for a reason. The flavoring is very subtle…you can smell it, but you can barely taste it. Less is more in this case. If you like the taste of plain water you will like this because it gives it a tiny burst of flavor, like slightly jazzed up water. It tastes like water with the essence of the fruit for flavoring. You can buy a variety pack of (12) 16 ounce bottles in various flavors. When cold they are very refreshing. I took them along on a hike with friends and everyone really liked them. I saw at their website that they are introducing a new sparkling version called Hint Fizz. I look forward to trying this as well. One of my favorite ways to enjoy sparking water is with a little bit of stevia mixed in so it almost tastes like a healthy version of a soda. I recommend this product as a healthy alternative to most drinks on the market today. Whenever I feel ill and my appetite is suffering, I always go for rice pudding. To me, it is the ultimate comfort food. And even better than rice pudding….tapioca pudding. Yum! 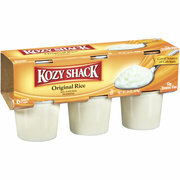 I received some free samples of Kozy Shack’s rice, tapioca, and chocolate and vanilla puddings to try. They make an original, lactose-free and sugar- free version. I tried them all. They come in cute little individual cup servings which I love because when it comes to any kind of pudding I could eat a few containers of this stuff and still want more. I have one small snack cup a night before bed. The sugar-free version has only 70 calories and about 11 net carbs. It satisfies my craving for something sweet and comforting. I could barely tell the difference between the regular and sugar free variety. The sugar free version was slightly less sweet but still sweet enough. The pudding was smooth and creamy and the rice was soft, not chewy. I love tapioca. It has such a cool mouth-feel/texture to it and this was definitely my favorite. The original version has more calories (about 130) which is still fine for a snack. The lactose-free pudding was a little darker in color but tasted just as good as the original. I loved them all. I tried adding raisins and a little cinnamon to the rice pudding which just made a good thing even better. They are all delicious! I also tried their regular chocolate and vanilla puddings which were awesome as well. All of their puddings are gluten-free and kosher. Highly recommended!